Gardeners have been developing specific areas or “rooms” within their gardens for hundreds of years. An avenue of trees, reflecting pools, ponds, an orchard, a terrace, vine-covered pergola, vegetable garden, perennial garden, shade garden, herb garden, woodland walk, a nuttery, winter garden, spring gardens, white gardens, blue gardens, hot border gardens, wild garden, and the rose garden ― all give a varied experience of the garden as you move through them. But it is the “enclosed garden” that achieves this to the greatest degree. Hortus conclusus is the Latin term for enclosed garden. The word “garden” is at root the same as the word “yard”; it means an enclosure. The gardens from the Middle Ages were surrounded by high walls to protect the occupants from the world beyond, a dangerous place of wolves, wild boar, bandits, plagues, and war. These first gardens were monastic and were enclosed so that the monks felt safe and secluded to lead a contemplative life. What we know of these gardens is not so much from the people who cultivated them, but from the paintings, poems and tapestries in which the garden was a metaphor for paradise on earth. Early paintings show a small plot of grass sprinkled with tiny flowers and a raised seat made of turf. Over time, water features were added (fountains, stone channels, reflecting pools) and often shaded by arbors of pleached or clipped trees. The plants most often depicted were roses, lilies, peonies, irises, pinks, poppies, columbines, lavender, rosemary, and marigolds. These flowers were grown with herbs and salad greens, used both for eating and medicinal purposes. In the Middle Ages it was the garden that provided privacy, unlike the castle with its large bustling communal rooms including many servants. The garden was the place to escape the crowds. During the Tudor period these enclosed gardens were bigger, pushing out farther into the landscape, but still contained with dense hedges, tall walls and plantings that gave the same safe feeling of enclosure on a larger scale. As gardens changed we have seen many fads come and go. Perhaps what has not changed is the desire for enclosed space. When I was young, my brother and I would build forts in which to play. Made from a refrigerator box, or a blanket thrown over chairs, we made a retreat from the world of adults. Later, with the help of our Dad, we threw some 2x4s together into the top of a mimosa tree and made a triangular tree house. Although, regretfully, I no longer build forts, I do go to spots in my garden that form a room-like place where I can feel away and in my own world. Virginia Woolf knew, and I agree, that we all need a room of our own from time to time. For many years I designed and built rooftop terraces in New York City. Manhattan rooftop terrace gardening is not for the fainthearted. Much like the citizens of Gotham who insist on living cheek by jowl, the gardens are by and large built on top of the heap. The views from there are some of the most beautiful in the city, a world where skyscrapers meet sky. Italian arches, sculpted Roman heads, and large garland urns are design elements often featured on prewar buildings. Water towers appear up and down and along the skyline, knitting together glass and brick and wood. Roof gardens high above the street offer solitude not dissimilar from the enclosed cloister of old. It is one of the few places outside where you can find privacy and quiet in the bustling city. The first garden room I made in my own garden is the “Big Leaf” room, which has an 8-foot high by 25-foot long wall on one side of it. 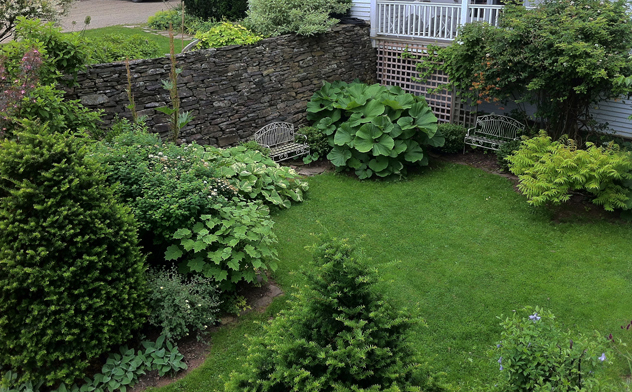 The underside of the front porch makes another “wall” of the room and two large formal borders comprised of tall shrubs and perennials with, yes you’ve guessed it, large leaves, complete the enclosure. This is the most private place in my garden and on a hot day the coolest place to be. When I lived in Scotland I used to go all over the British Isles looking at incredible gardens. 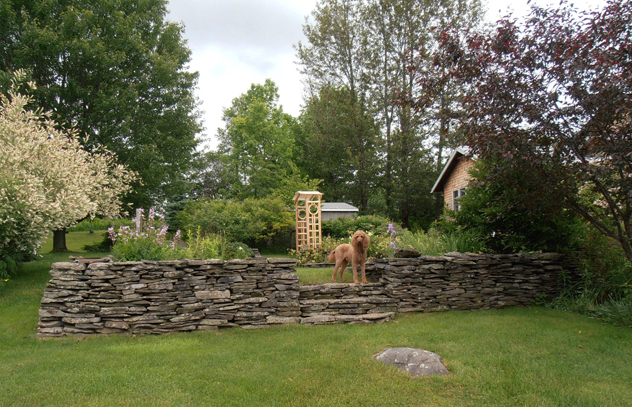 Without exception, if there was a walled “kitchen” garden, which there often was, it was my favorite place to be. Sometimes these spaces can encompass several acres with very tall walls (12-to-14- feet) made of brick or stone. Vegetables are not the only plants grown in these magical spaces. Beautifully clipped, patterned espalier fruit trees, climbing roses and flowering vines are often found on the interior walls, and long rows of flowers just for cutting and bringing into the house are plentiful. These enclosed gardens are very practical because the walls keep out the wind, and the stone or brick warms up during the day and gives the heat back at night, creating a micro climate for plants. They also keep out rabbits and deer. One garden I went to in Scotland had hollow walls and in early spring the gardeners would fill the walls with hot coals to keep the peaches and apricots that were growing up the walls safe from frost! 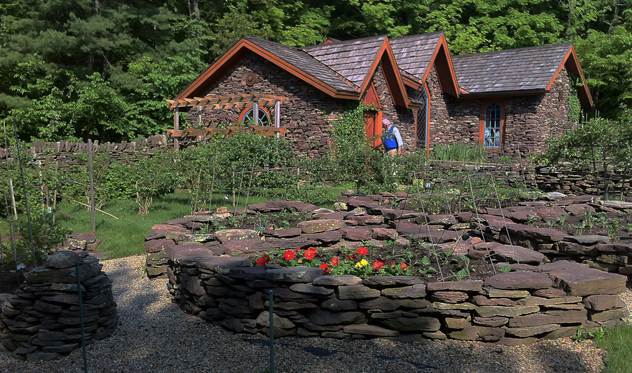 Local residents Tom Morgan and his wife, Erna Morgan McReynolds, were inspired by the enclosed gardens they saw while visiting Scotland. 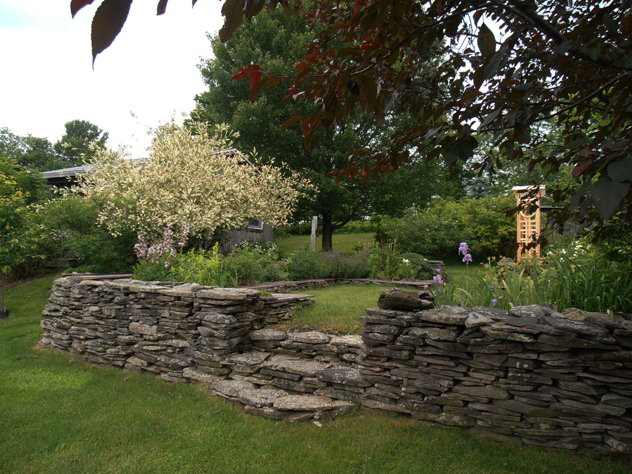 They hired stonemason Robert Johnson to build a large walled garden and stone house on their land. 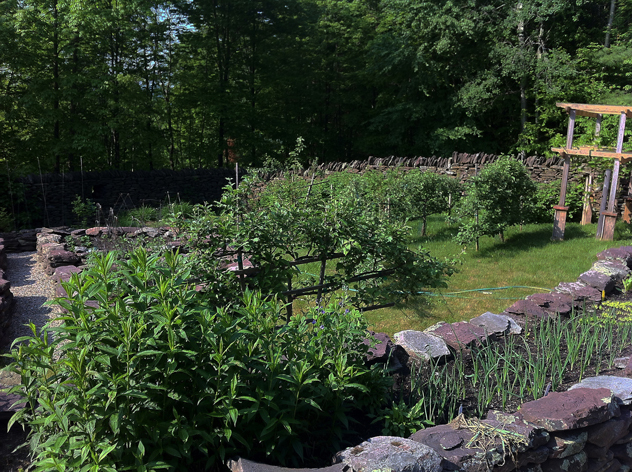 When I asked Tom what the inspiration was for his enclosed garden, he said, “the deer!” They also liked espalier fruit trees and have planted an impressive collection within the enclosed garden. Tom also had vegetable beds made of raised stone to make planting and weeding easier. Tom Morgan standing near stone house and enclosed walled garden. Espalaier fruit trees inside walled garden. It’s not hard to create an enclosed space or the feeling of one. By using the side of your house or outbuilding you can easily enclose the other three sides with plants leaving an entryway into the room. The same feeling can be achieved by making an area in the garden under a pergola, or by placing a bench under the canopy of a low-hanging shade tree. Planting a group of four trees spaced apart so that their canopies eventually touch is also a great way to create an enclosed feeling. These spaces create containment, a retreat from the larger world, and a place to be in and to contemplate nature.